Throw the bride to be a classy champagne brunch with our champagne and cupcakes party theme. ►Listing includes a custom 5x7" invitation in either High Resolution JPEG or PDF format. 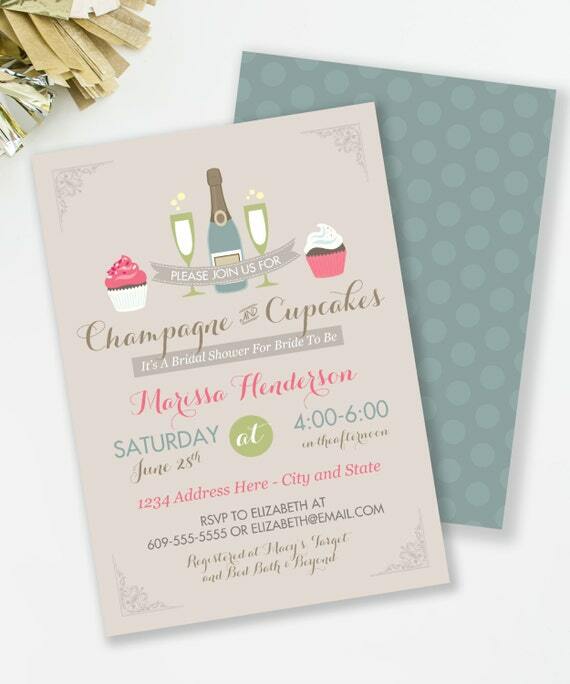 PDF’s will have 2 invitations per page, and are meant for home printing or copy/print stores like Staples. JPEG is a single file you can upload to an online photo lab or print from home. Invitation will include a matching back design you can use if using a print shop that allows for it. Invite fits standard A7 envelopes which are NOT included, as these are DIGITAL files only. ►Your DIGITAL order will be emailed to you within 3-4 business days (Mon-Fri, Orders placed Fri-Sun will not be started until the next week). If you need your invite faster, you can select the 1 Business Day time frame at checkout. Rushed Invites will be sent within 24 hours.